The villagers had caballed against her, but none could augur the consequences of her anger. At dusk on the night of the new moon, she collected her potions and locked herself in her attic. She had symbols for every sign of the zodiac, no-one would escape her wrath as she sang and chanted, mixed and stirred, her fingers dripping ether-laced droplets of her own blood into the pot. She rocked and swayed in rhythm, rolled her eyes up to the tattered curtains looking out into the night, calling in favours from the dark side without a single misgiving. By morning, she and her cat had vanished without trace. Within days, the Strangleweed took hold, choking crops and flowers alike. Nothing flourished in the village, livestock had no fodder and perished, trees died and the land became a barren wasteland. Within a year, it was a ghost town. Folklore referred to it as the Curse of the Grimalkin, though whether it pertained to the Witch or her Familiar was never clear. 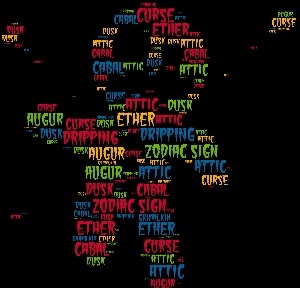 This entry was posted in blogging, Challenge, fiction, word prompt and tagged Mindlovemisery’s Menagerie, Wordle. Bookmark the permalink.